When I set out to do this blog two years ago, I really didn't expect much to come of it. I really didn't even expect to stick with it. And I really really never expected to have over 500,000 page views. But it is becoming something (I hope), I am sticking with, and I have as of today almost 530,000 page views. And it all blew up because of one recipe...Smothered Chicken. When I made that Smothered Chicken, it was sort of on a whim. My husband and I enjoy creamed spinach and sauteed mushrooms with steaks. So we sat in the living room and briefly tossed around the idea of piling them on top of some chicken and adding some cheese. We ate it, and it was good. We took the pictures. My husband says all the time that he didn't even like the picture that much. But you did. You visited my site in droves and still are visiting. 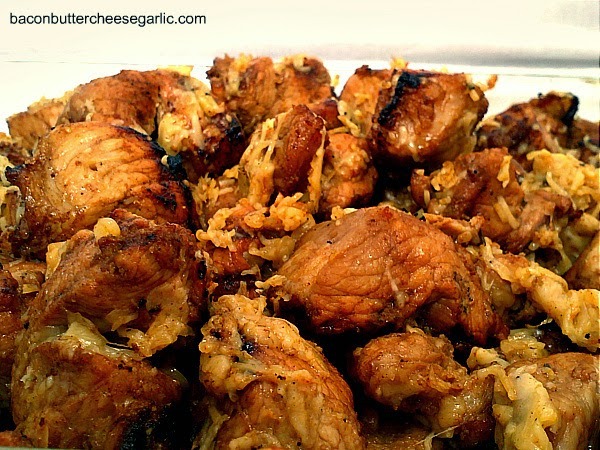 I have had so many people message me that they tried the Smothered Chicken and loved it. It was such a proud moment for me. Something I did, just an ordinary woman, is being noticed...a lot. Of course, now people are viewing all of my recipes and enjoying those too. But that Smothered Chicken kick-started what has become something I really enjoy, blogging. I love to write, and it's obvious that I love to cook. But now I get to share it with people. It's almost like I'm cooking for you, which I love to cook for people and share. So, in honor of hitting the 500,000 page view mark and in honor of that Smothered Chicken, I thought it was apropos to do another smother. Some of the ingredients are similar, but the taste is different. This time I smothered the chicken with artichoke spinach dip and smoked gouda. And it was good. I hope you all love it as much as you love the Smothered Chicken. I am so grateful to you, my fans and followers, for giving me the courage to keep going and sharing. I thank you all so much for believing in an ordinary woman living an ordinary life. NOTE: I cook chicken in the oven at the restaurant I work in, and for me it never takes more than 40 minutes to get done. I have had some recipes in the past where people say their chicken takes much longer to cook. I strongly urge you to use a meat thermometer and make sure your chicken is done that way. If you find that it isn't cooking as fast, hold off on putting the topping on the chicken until you have about 10-12 minutes left of cook time. Preheat the oven to 350 degrees. Sprinkle the seasoned salt, black pepper and garlic powder on both sides of each chicken breast. Lay them on a sheet pan and cook for 16 minutes. In a food processor, combine the cream cheese, Parmesan cheese, artichoke hearts, mayonnaise and garlic cloves. Mix until well combined. Stir in the spinach. Take the chicken out of the oven and flip the breasts over. Divide the dip mixture into four and layer on top of the chicken. Lay the gouda slices over the dip mixture. Return to the oven and bake for an additional 12-14 minutes or until the chicken is done (165 degrees internally) and the cheese is melted and browned. Who doesn't love a mushroom & swiss burger? (Don't answer if you don't.) And what could be done to improve it? A lot. How about bacon, crispy onion strings, and garlic aioli! Served on an onion bun, this burger was fit for a king! Or a queen, for that matter. I did a lot of research on the best way to season a hamburger patty, and I came to the same conclusion time and again. Just salt and pepper. Sure, I love a burger with onion soup mix in it or barbecue sauce or A-1 and many other variations. But a lot of chef recipes I looked at kept it simple. The flavors from the other condiments are where the bold moves should be. But the meat should taste like meat. So I tried it, and it worked. Really well. Paired with tender sauteed mushrooms, some thick-cut crispy bacon, baby swiss, and a creamy garlicky mayo, this burger was a big hit. And a big bite. You'll probably need a knife and fork for this one. What's your favorite burger patty seasoning? Mix the ground beef with salt and pepper to taste. Shape into patties. You'll get about five patties. Refrigerate for about an hour. Soak the onion slices in enough buttermilk to cover and season with the seasoned salt and cayenne pepper to taste. Refrigerate at least an hour. Mix the aioli ingredients together and refrigerate. Preheat a small skillet to medium high heat. Add in the butter to melt and drizzle in some olive oil. Cook the mushrooms until browned. Deglaze the pan with the wine and add in the garlic. Season with salt and pepper to taste and cook until most of the liquid is gone. Mix the flour and more seasoned salt and cayenne pepper together. Heat some peanut oil in a large skillet to medium high heat. Dredge the onion slices in the flour mixture and cook the onions in batches until crispy and browned. Drain on a paper towel. Grill the burgers over direct heat for 5-7 minutes per side or until done. Place the cheese slices on the meat and return to the grill just long enough to melt the cheese. To assemble the burgers, spread the aioli on each side of the bun. Top with a burger, the cooked mushrooms, bacon slices and onions. 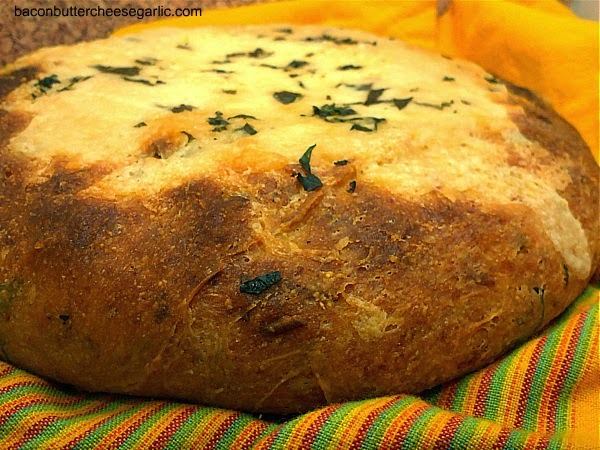 A different spin on bread includes cornmeal, which gives it a great texture, and a great cheesy taste! Put yeast, sugar, and warm water in the bowl of a stand mixer. Let it sit for about 5 minutes until foamy. Put the milk, salt and 1/2 C butter in a small saucepot. Bring almost to a boil but not a full boil. Remove from heat and cool slightly. Whisk in the egg. Add the flour and cornmeal to the mixing bowl. Pour in the milk mixture and add in the remaining ingredients except for the reserved cheese, parsley, and melted butter. Knead with the dough hook until it forms a ball. Put the dough in a large greased bowl and cover. Let it rise for at least one hour. After the first rise, turn the dough out onto a well-floured board. Divide the dough in half. Shape the dough into two loaves or place it into two greased loaf pans. Let it rise for another 30-45 minutes. Preheat the oven to 350 degrees. Bake the bread about 25-30 minutes. Turn on the broiler. Sprinkle the reserved cheese and parsley onto the loaves and return to the oven to melt the cheese. Remove from the oven. Brush the melted butter over the bread and cover with foil and cool completely. We really can't get enough spicy food in this house. I'm surprised we haven't burned holes in our esophagi (yes, that's the plural for esophagus. I had to look it up.) from all the spicy food we eat. But it's so darn tasty. I've mentioned the story before about how I mixed up about nine different hot sauces and pepper powders to marinate chicken for my husband. It wasn't pretty. Another favorite of mine is shrimp. I love it any way I can get it. I have loved shrimp since I was in Pampers. Okay, I probably didn't eat them that far back, but it's been since I was a child. Fried shrimp, shrimp scampi, grilled shrimp, shrimp boil, shrimp in sushi. I sound like Bubba from Forrest Gump now. That's how much I really love shrimp. Another favorite combination of mine is tomato basil. So what could be better than to marry some of our three favorite things together? Nothing, except three can't be married. Except with food. So I came up with this Tomato Basil Shrimp recipe that was banging! Spicy, tomatoey, basiley grilled shrimp. Pure heaven. My husband adored this recipe and ate most of it. And he's not even that big of a shrimp fan. That's how good it is. How many kinds of shrimp can you remember from Bubba's list? Place the shrimp in a zipper bag. Add in the remaining ingredients and seal. Shake it around to mix. Marinate at least 30 minutes. 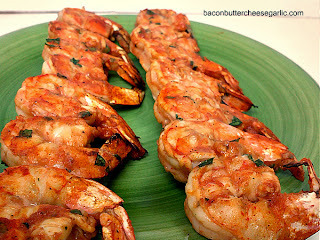 Thread the shrimp onto skewers and grill shrimp over direct heat for 2-3 minutes on each side or until done. It goes fast, so don't walk away. My most favorite restaurant is Texas de Brazil. I don't typically overeat at restaurants, but I make an exception at this one. It's so worth a pair of stretchy pants and a bottle of Tums later. If you haven't heard of it or don't know what a churrascaria is, it's a restaurant that cooks its meat churrasco style which is sort of a rotisserie type of cooking. It originated in Southern Brazil where gauchos, or cowboys, had fireside roasts. Texas de Brazil has a concept where "gauchos" walk around with skewers of a multitude of different meats and carve it for you at the table. You are given a card to flip on one side if you want more or to the other side if you want to stop. They probably have 15 different types of pork, beef, chicken and lamb. And the salad bar is amazing! I could go just for the many varieties of potato and pasta salads, imported meats and cheeses, many different marinated veggies, and even sushi. I sound like a commercial now, huh. Over Memorial Day weekend, we decided to have our own churrascaria night. We cooked a lot of different meat, but the one I loved the most was the parmesan pork loin. We marinated it the night before and then cooked it on the grill the next day. It was so darn tasty that I ate some on a breakfast taco the next day! And, no, my husband and son didn't walk around with skewers of it and carve it. Maybe they should have. I'll have to remember that. The marinade we made was incredible and the meat was so tender. And the parmesan cheese melted all over it made for a really tasty treat. Other recipes I've read say to roll the skewers around in the cheese and return to the grill. However, I couldn't figure out how to get the cheese to stick, so I just stuck it all in the oven and melted the cheese on. Remember the pants called gauchos? Cut the meat into about 2-inch cubes and place them in two zipper bags. Mix remaining ingredients except the parmesan cheese in a bowl. Divide it between the two bags. Seal them up and refrigerate overnight, turning occasionally. Thread the meat onto skewers, discarding the marinade. Grill over direct heat for about 5 minutes on each side or until done, making sure not to overcook it. Remove the meat from the skewers and place on a large sheet pan. Sprinkle the parmesan cheese over the top, toss it around, and broil for a couple of minutes to melt the cheese. My husband absolutely loves Chinese (or Asian) food. Loves it. We even have a family tradition of having Chinese food for New Year's Day. His favorites are crab Rangoon and any kind of stir fry. My favorites are lettuce wraps and hot and sour soup. The kids, especially my son, love it too. So I wanted to make cabbage rolls, but I didn't want to do the same thing everyone else does. 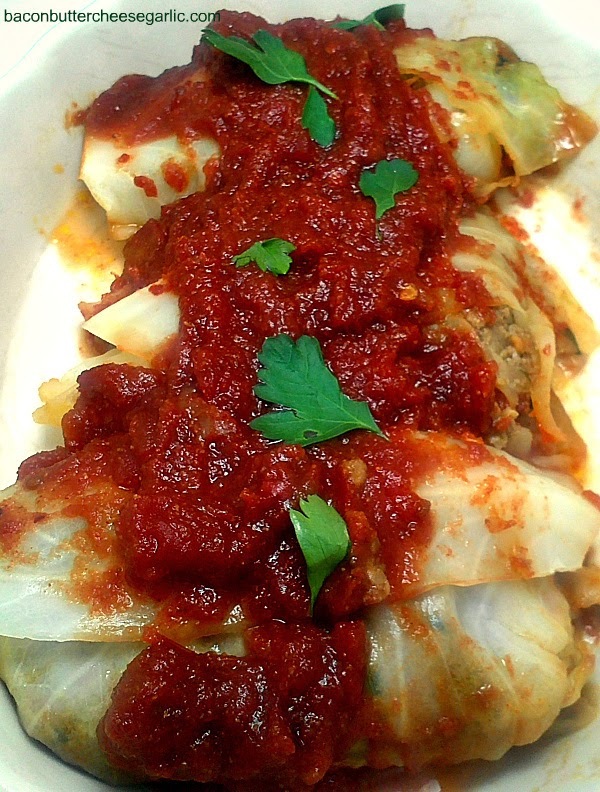 I know traditional cabbage rolls are filled with ground beef and rice and have a tomato sauce on top. So I thought about the components of an egg roll, and it took off from there. A traditional egg roll has cabbage, carrots, green onion, ground meat, and soy sauce, to name a few. So I thought, how can I deconstruct an egg roll and turn it into a cabbage roll? Lose the wrapper and use the cabbage as the wrapper. Genius! And, for the sauce, I went with an Asian-style barbecue sauce instead of a tomato sauce. And it was so good. I made it a little too spicy for the kids, but it was a huge hit with my husband. I also used ground turkey, so it's a lot healthier than an egg roll or traditional cabbage rolls. Some of the ingredients may be foreign to you, but they are optional and can be left out. But, if you're game, try them. They give such a great depth of flavor. And the amounts of soy sauce and hot mustard and chili flakes is based upon your taste and spice tolerance. So get your wok out and Yan Can Cook! Remember that show? Peel the leaves from the head of cabbage and boil until mostly tender. You will have some small center leaves left over, so you can save those uncooked for another use. You will get about 8-10 rolls, depending on the amount of filling you use. Preheat a large skillet to medium high heat and drizzle in some olive oil and a few drops of sesame oil. Cook the carrots and green onion for a couple of minutes. Add in the ground turkey and cook until browned and done. Add in the remaining roll ingredients except the cabbage and cook until the liquid is almost cooked out. For the sauce, combine all of the sauce ingredients in a sauce pot and cook and simmer until thickened and reduced, about 10 to 15 minutes. Preheat the oven to 350 degrees. Spoon some filling down the center of a leaf of cabbage and wrap and tuck the cabbage around the filling. Place the rolls in a casserole pan seam side down. Cover the rolls with the sauce and bake, covered with foil, for 15-20 minutes or until the cabbage is completely tender. I don't normally do copycat recipes, but there is one I love. It's out there everywhere. It's Chili's Southwestern Egg Rolls. The recipe is pretty much identical. My husband loves them, and it's a favorite for when we have "Party Food Night." Now, I am doing this copycat recipe, sort of. Instead of filling tortillas with the filling and deep frying them, I stuffed bell peppers with them. And added some smoked gouda on top. They were fabulous! And probably a lot healthier too. 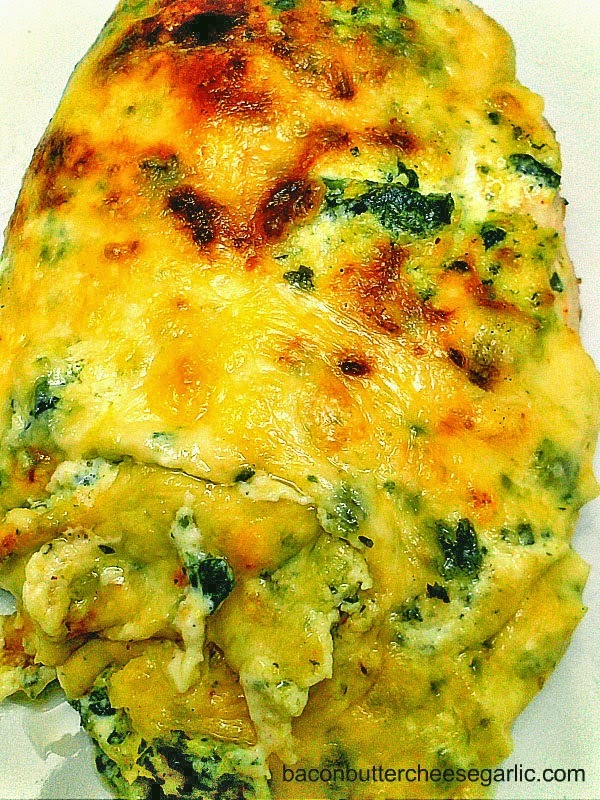 The filling consists of chicken, black beans, spinach, jalapenos, Monterrey jack cheese, and green onions. 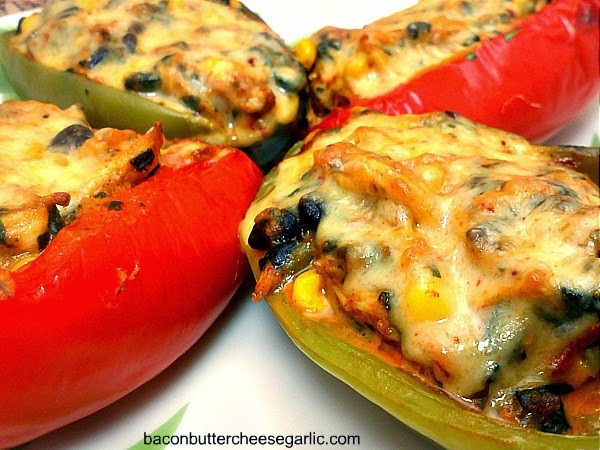 And the red bell peppers are usually in the filling, not on the outside. And I was pretty proud of myself for how this came together, seeing as this was the first time I've ever made stuffed peppers. And, if you're a stuffed pepper fan, I came up with a way to cook the peppers in a much reduced amount of time. Most recipes I looked at said to cook them for 45 minutes to an hour! Not necessary here! So here goes Southwestern Stuffed Peppers. Preheat the oven to 350 degrees. Wrap the bell peppers whole with foil. Bake them on a sheet pan for 15-30 minutes, depending on the size, until they are mostly tender. The green ones cook faster than the red. Let cool. Preheat a large skillet to 350 degrees. Drizzle in some olive oil and cook the jalapenos and green onions until tender. Add in the chicken, chili powder, cumin, garlic powder, and chicken stock. Add salt and pepper to taste. Add in the spinach, cilantro, black beans and corn. Cook until they are heated through. Remove from heat and stir in the Monterrey jack cheese to melt. Cut the bell peppers in half. Remove the seeds. Leave the stems on for presentation. Divide the filling among the eight halves. Place them in a casserole pan and lay the gouda slices over the top. Bake for about 15 minutes. I don't usually eat Ramen. My husband and the kids love it, but I just usually don't eat it. I ate it when I was younger, but I really mostly only eat from-scratch food. So I thought I'd make an exception and make them something with Ramen. And, you know what, it turned out really good. They loved it and raved about it. Our son even ate the leftovers. Do you have trouble getting your family to eat leftovers? Anywho, one of our favorite flavors for Asian food is Hoisin. Now, I didn't make the Hoisin sauce from scratch. I haven't tackled that yet. But there are some pretty good store-bought brands of Hoisin. And the meal was really easy to cook and quick too. 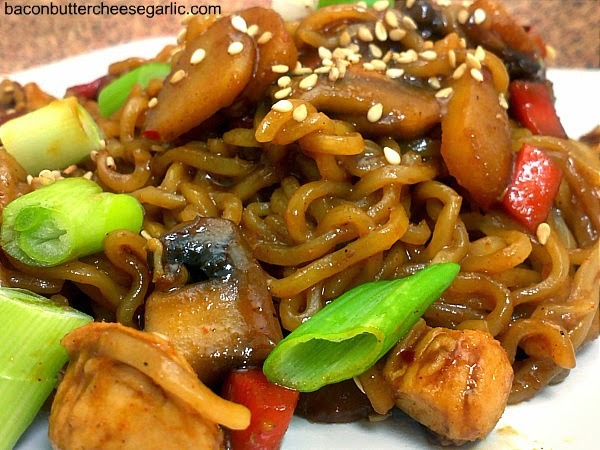 If you have Ramen fans in your house, this is a darn tasty dish that is sure to please. Preheat a large skillet to medium high heat and melt the butter and drizzle in some olive oil. Cook the chicken for about 5 minutes or until no longer pink. Remove to a plate and cover with foil. Add the carrots to the skillet and cook until almost tender. Add in the mushrooms and cook until they're tender. Add in the red wine and cook a couple of minutes to deglaze the pan. Add in the garlic, Hoisin, a few drops of sesame oil, a few drops of fish sauce, the chicken seasoning packets, and the red pepper flakes. Fill the Hoisin jar with water and add that to the skillet. Cook until thickened and bubbly and reduced. Remove from heat and add the chicken back in. Cook the Ramen noodles according to directions. It only takes a couple of minutes. Drain the Ramen and toss with the sauce. Garnish with the green onions and sesame seeds. If you're a fan of Pinterest, you've seen many versions of Mexican Stuffed Shells. And, of course, I had to do my own. Mine is full of taco meat, corn, cream cheese, and it's covered with my most favorite enchilada sauce, chili gravy. If you haven't read my posts before on chili gravy, it's the brown sauce used in most Tex-Mex restaurants to cover enchiladas. I'll give you some history on this chili gravy. 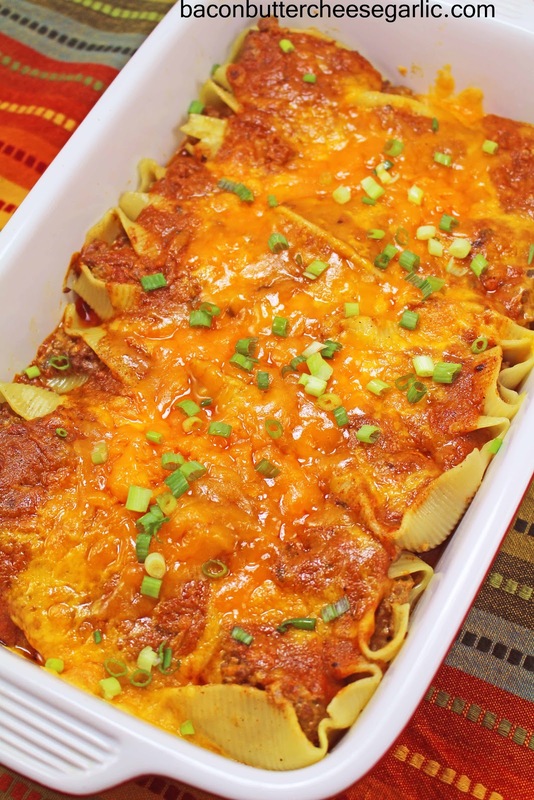 A few years ago, my husband challenged me, as he does many times, to find the best enchilada sauce ever, one like you would find in any Tex-Mex restaurant. So I searched and experimented and searched some more, and I came across a recipe from a man named Robb Walsh. One of his books is called "The Tex-Mex Cookbook." It is rich with the history of Mexican immigrants coming to Texas and the melding of flavors between the two to become what is now Tex-Mex cuisine. If you're a Tex-Mex fan, you should check out that book. Anywho, the flavors of this pasta are so good and it's really not that hard to put together. And it's darn tasty! Meanwhile, preheat a large skillet to medium high heat. Drizzle in some olive oil and cook the onion until tender. Add in the ground beef and cook and brown until done. Drain if necessary. Add in the taco seasoning and water and cook until the sauce is reduced. Add in the garlic, cream cheese, and salsa. Cook and stir until the cream cheese is melted and the meat sauce is well combined. Stir in the corn and green chilies and remove from heat. For the chili gravy, melt the lard in a skillet over medium heat. Whisk in the flour and cook about a minute. Whisk in the chicken stock quickly to prevent lumps. Add in the remaining ingredients and whisk and cook until thickened and bubbly. Remove from the heat. Preheat the broiler. Spoon half of the chili gravy into a 9 x 13 pan. Spoon some of the filling into all of the shells and place them in the pan. Spread the rest of the chili gravy over the top and top with the cheese. Put the shells under the broiler for a couple of minutes to melt the cheese. Whisk all ingredients together except the cheese, jalapenos, and peanut oil. Stir in the cheese and jalapenos. Preheat the peanut oil to 350 degrees. 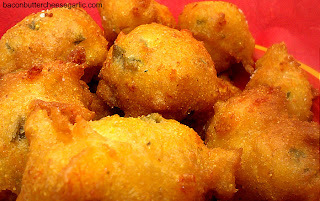 Spoon the hush puppies about 2 T at a time and fry the hush puppies for a couple of minutes on each side until browned and cooked through. Remember the cans of German Potato Salad you used to be able to find in the canned goods section of the grocery store? I'm not sure if you can still find it, but I loved it when I was a kid. Now that I'm an adult, however, I really don't eat food out of cans except for maybe canned tomatoes or occasionally corn or hominy. But I've created a grown-up version of this sweet-and-sour treat called German Potato Salad. Originally called "Hot German Potato Salad," it's a nice compliment to many dishes. And it's darn tasty too! Boil the potatoes until tender and drain. Meanwhile, melt the bacon grease in a small skillet and brown the pancetta. Remove the pancetta from the skillet and drain on a paper towel, reserving the grease. Add in the vinegar, sugar and water and cook over medium heat until reduced and thickened, about 5-6 minutes. 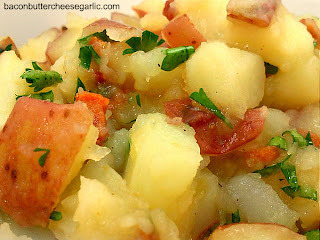 Gently mix the sauce, parsley, and cooked pancetta in with the potatoes and season with salt & pepper. Serve warm. In a stand mixer, add in the yeast, sugar and water. Let it sit about five minutes until foamy. Mix in the flour, salt, and garlic powder with a dough hook. Knead until it becomes a ball, adding the additional 1/4 C water if necessary. Put the dough in a large greased bowl and cover. Let it sit in a warm place about an hour and until it has risen very large. Turn the dough out onto a well-floured board. Grease a 7 x 11 casserole pan. Pinch off pieces of the dough and roll into 1-inch balls. Spread half of the balls into the pan, leaving some room in between for rising. Brush half of the melted butter over the top. Spread half of the cheese over the top. Repeat this process with the second layer of balls, butter, and remaining cheese. Cover loosely and let it rise until it rises over the top of the pan, about 45 minutes. Preheat the oven to 350 degrees. 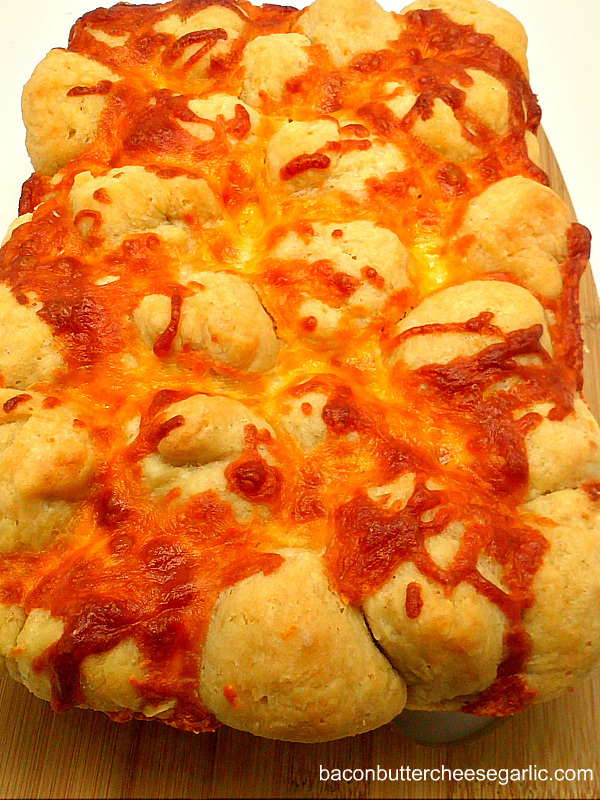 Bake the bread for at least 20 to 25 minutes or until it's cooked through and cheese is melted. Remove it from the oven and cover it with foil while it cools. This helps soften the bread back up. 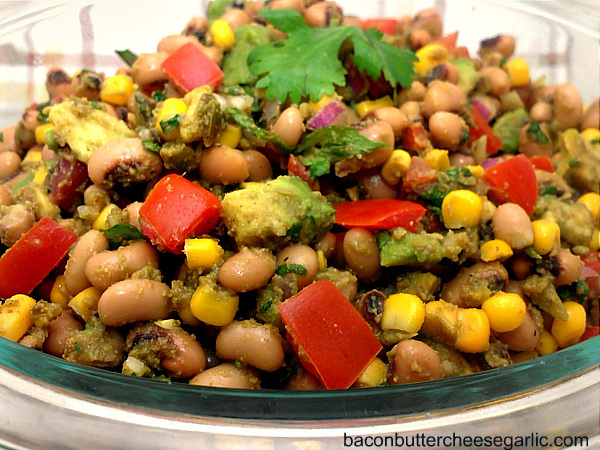 There are many versions of this recipe out there on the internet, all including cornbread, beans, cheese, and dressing. This is my version which uses hominy, jalapenos, cheese, bacon, and my homemade Jalapeno Ranch Sauce. It makes a ton, so it's really a great recipe to take to holidays and get-togethers. Hope you enjoy it. Cook the cornbread according to directions. Mix the tomatoes, green onions, jalapenos, and parsley in a bowl and season with salt and pepper. In a large clear bowl, crumble half of the cornbread. 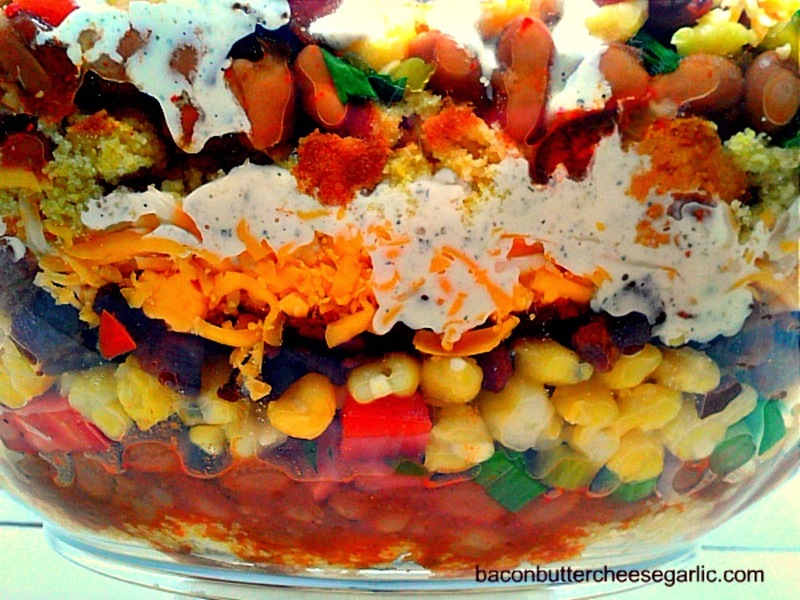 Then layer one of the cans of beans, half of the tomato mixture, one can of hominy, half of the bacon and half of the cheese. Then spread on half of the dressing. Repeat, ending with dressing. Mix all of the ingredients together in a blender or food processor. Enjoy with tacos, enchiladas, quesadillas. Use it anywhere you want! I'm not sure how this dish came about, but it's a good one. A little spicy, a little tang, and a whole bunch of flavor. It's great for holidays and get-togethers. Bring some to your next gathering, and it's sure to be a hit. Mix all ingredients together in a bowl and chill. Serve with tortilla chips. When I was a kid, my mom made chicken and rice a lot, probably because it was a cheaper and easier meal to serve. And I loved it. I loved the smell of it, the texture, the big chunks of chicken. And my family loves it now too. Hearty and full of flavor, yet still a much lighter, better-for-you meal. Sometimes, however, I want the version of chicken and rice from our friends south of the border, Arroz con Pollo. Still chicken and rice, but this version has an added punch of flavors. 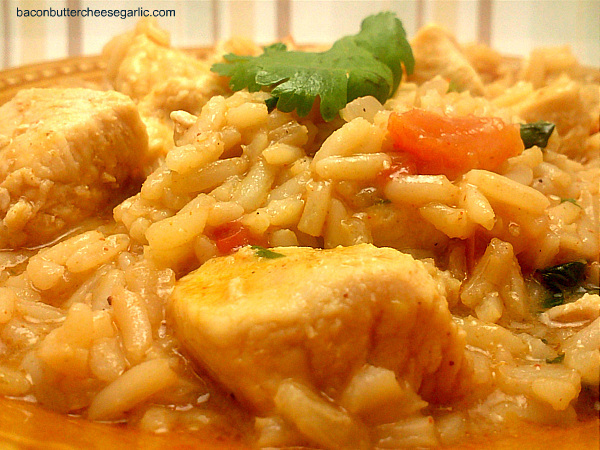 The addition of tomatoes, cilantro, and green chilies take this chicken and rice to another level. I do have to tell you a secret about myself now. I'm terrible at making rice. Seriously terrible. But I've developed a way to fix that problem. I'm going to give you the real instructions on making the rice in the recipe. However, if you are rice cooking challenged like me, here's my trick. I add in more chicken stock, a little at a time, until I finally get the rice soft. I know, I should be able to manage something as simple as rice. But it's usually a 50-50 toss-up on whether I have to cheat the recipe. Whichever way works for you. But I think you and your family will enjoy this classic, yet kicked-up version of chicken and rice. Are you rice cooking challenged? In a large pot or dutch oven, melt the butter and drizzle in some olive oil over medium heat. Cook the chicken about 5 to 7 minutes, being sure not to overcook the chicken. Remove from the pan and cover with foil to keep warm. If necessary, drizzle in some more olive oil. Turn the heat up to medium high. Cook the onion until tender. Put your rice in and brown it slightly. Add the remaining ingredients except the chicken and bring to a boil. Once it's boiling, turn the heat down to a simmer and cover. Cook for about 20-25 minutes or until the rice is tender (here's where you check it occasionally and maybe add in extra stock). Remove from heat and stir the chicken back in. My daughter is a self-proclaimed chooseatarian. Not a vegetarian or vegan, but a chooseatarian. She "chooses" to only eat good cuts of meat. She has completely forsaken any form of sausage or hot dogs. She "chooses" to only eat chicken, steak and ribs (go figure), and some roasts. It's not from any religious or activist reasons, only that she is a teenager and certain things gross her out. I used to be that way too. I went through a stage where I wouldn't eat meat still on a bone or chocolate. So I promised my daughter a vegetarian meal...sort of. I originally planned to make Pasta Primavera with no meat. But I just couldn't help myself. I am a meat eater, and I really thought this pasta needed chicken. So we compromised. I roasted double the veggies so that she could have an extra meal meat-free. And we were all happy. My husband loved it and raved on and on about it. From the delicious mix of roasted veggies to the delightful lemon cream sauce with a touch of parmesan, it is sure to be a family favorite. I used campanelle pasta which look like little bells or horns, but you can use whatever kind you like. And the veggies listed here are enough for the pasta only, so double them if you want a second veggie meal. Do you know any chooseatarians? Preheat the oven to 400 degrees. Put all of the veggies onto a sheet pan except the tomatoes. Drizzle some olive oil over the veggies and the juice of one lemon. Season with salt and pepper. Cook, turning occasionally, for 20 to 25 minutes or until all the veggies are tender, adding in the tomatoes during the last five minutes of cooking. While the veggies are cooking, cook the pasta according to directions. To start the chicken, melt the butter into a large skillet and drizzle in some generous olive oil. Cook the chicken on medium heat until done. The process is to poach the chicken, not brown it. Only cook it about 6-7 minutes so as to not overcook it. Remove it from the pan and cover it with foil to keep warm. Deglaze the pan with the wine and cook a couple of minutes to reduce. Add in the chicken stock and cook again to reduce. Add in the garlic and cream. Cook until the cream starts to bubble. Stir in the parmesan cheese and juice of the second lemon. Season with salt and pepper. Return the chicken to the sauce and add in the veggies. Stir the sauce into the pasta and serve. You can sprinkle additional shredded parmesan cheese over the top. Don't you just love family get-togethers and holidays? Everyone brings something wonderful to eat and share. Especially in the summertime. Barbecues and cookouts bring people together. An old-fashioned dish that used to be very popular in Texas is Pea Salad. 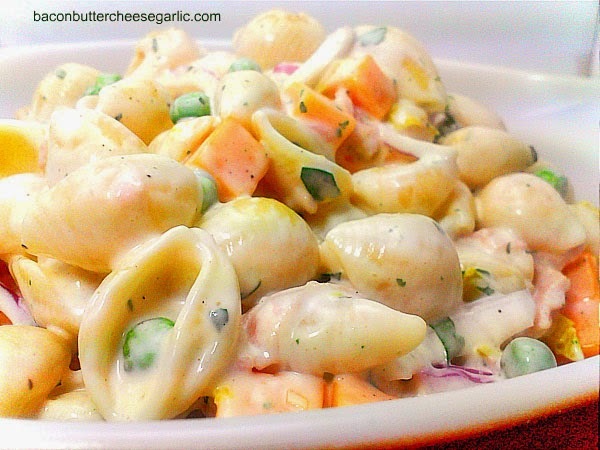 The traditional way is with mayo, peas, red onions and cubes of cheddar cheese, sometimes pasta, sometimes ham too. It's so good this way. But sometimes we need to update recipes a little. Not that the original way is bad, but we change with the times. This version that I made has all of the original goodies, but I also added in some extras. A splash of pepperoncini peppers make this salad pop, and, my personal favorite, Ranch. It's a creamy, delightful little salad that's sure to be a big hit at your next get-together. I'll put "optional" next to the un-original ingredients in case you want to try it the old way. But the new way is oh so good. And it makes a lot, so it's great for sharing, if you make it to the get-together without eating it all. Do you like Ranch as much as I do? Cook the pasta according to directions. Drain and run cold water over it to cool it quickly. Mix the Ranch and mayo together with a whisk. Add in all of the remaining ingredients and the pasta and gently stir to combine. Serve cold. **NOTE: If you are making this salad way in advance, you should probably double the mayo and maybe even the Ranch. The pasta absorbs much of the sauce in the refrigerator after time. Summer is my absolute most favorite time of the year. I've made it no secret that I don't like winter. There is so much more fun to be had for me in the summer. Time in the pool, going to the lake, hiking in the mountains when we go to Colorado, playing foosball in the garage (yes, we have a foosball table, great fun). It's time to put away the socks and get out the flip-flops. My family is a flip-flop-wearing family. You should see the four of us, flip-flopping away wherever we go. Another thing I like about summer is we eat lighter. Sure, I love the filling comfort food that comes with winter, but I love fresh veggies and salads. Even my son likes salad. I didn't know until I made this one that he actually likes avacados. The kid won't drink a Coke to save his life, but he'll eat pretty much any vegetable. In Texas, a lot of people call all sodas "Coke" instead of "soda" or "pop." People say, "do you want a Coke?" When they answer yes, the next question is, "what kind?" Anywho, this is my version of a Cobb salad, which usually has chicken, eggs, blue cheese, tomatoes and bacon. But, since I can get that version any day at the restaurant I work at, I decided I wanted something different, something with a little kick. A Southwestern Cobb Salad. And I do believe this is the best salad that I've ever made, maybe ever eaten. The chicken is marinated in a chipotle pepper marinade. The fresh corn is roasted, bacon crispy, and the tortilla chips seasoned with chipotle and Ranch. All on a bed of fresh red leaf lettuce, it made my heart sing. Top it with whatever dressing you like. I used my Jalapeno Ranch Dressing which is pretty darn tasty and wildly popular. This version is for four people, so adjust the measurements to fit your family. For the chicken, mix the olive oil, cumin, garlic, and chili powder together in a zipper bag. Add the chicken and enough water to cover the chicken. Seal the bag, shake it around, and marinate at least two hours. Preheat the oven to 400 degrees. Leave the husks on the corn and roast in the oven on a sheet pan for about 15-20 minutes or until soft. Using a knife, cut down the sides of the corn to remove the kernels. Reduce the oven temperature to 350. Put the chicken on a sheet pan and cook about 12-14 minutes per side until done. Let it rest and then cut into bite-size pieces. For the tortilla chips, mix the packet of Ranch dip mix and the chipotle powder together. Heat up the bacon grease or vegetable oil. Fry the tortilla squares until crispy. Drain on a paper towel. Immediately after draining them, sprinkle on the Ranch and chipotle mixture. You may or may not have some of the Ranch mixture left over, depending on how much you use. 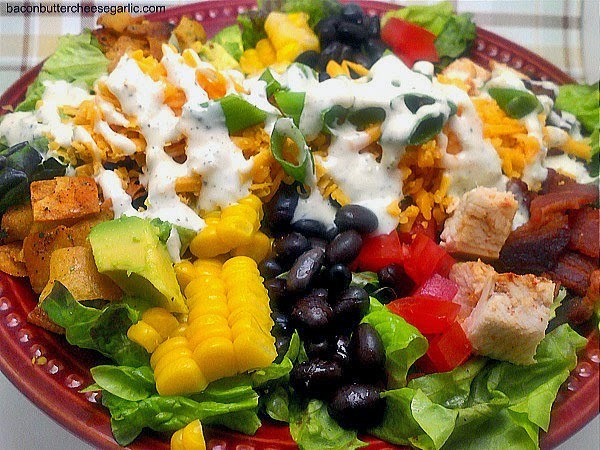 To assemble the salad, put the chicken, black beans, tomatoes, avacados, corn, bacon, and tortilla chips in rows over the lettuce. 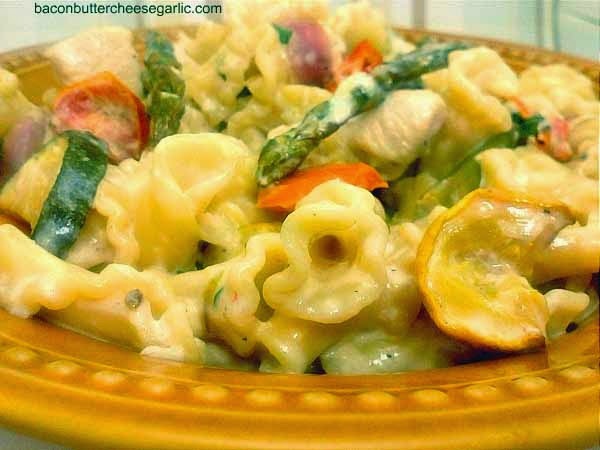 Garnish with the cheese and green onions and top with dressing. Mix all of the ingredients together in a blender or food processor. My mother lives in Colorado, which is an awesome place for us to go on vacation. There is an Italian restaurant there called Biaggi's which I love. There are no Biaggi's in Texas, so I only get to eat there maybe once a year. They have great pasta, and they also have great creme brulee. My mother and I have come close to stabbing each other in the hand with a fork while sharing creme brulee. We finally learned to order our own. My favorite thing from Biaggi's is their Ziti al Forno. 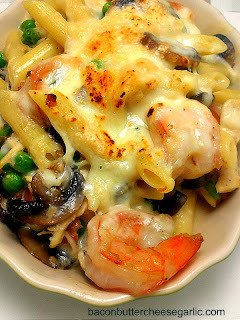 It's a decadent creamy pasta with chicken, shrimp, proscuitto, and mushrooms. The sauce claims to be a lobster cream sauce, but rumor has it there is no lobster in the sauce. Either way, it's good. So here's my take on this delicious pasta. Ever come close to stabbing someone with a fork when sharing food? Cook the pasta according to directions while you make the sauce. Preheat the oven to 350 degrees. Drizzle some olive oil in a large skillet over medium high heat. Cook the proscuitto for a couple of minutes to crisp it up and remove it from the skillet. Melt the butter in the skillet and cook the onions and mushrooms until tender. Add in the wine and deglaze the pan. Add in the chicken stock and cook until reduced, a couple of minutes. Add in the cream and garlic and cook until it starts to bubble. Turn the heat off. Whisk in 1 1/2 C Mozzarella cheese and the Parmesan cheese to melt. Stir in the shrimp, peas, chicken, parsley and proscuitto. Taste for salt and pepper and adjust accordingly. Toss this all with the pasta. Put the pasta in a 9 x 13 pan and sprinkle the remaining 1 1/2 C Mozzarella over the top. Bake 15 to 20 minutes or until cheese is browned and shrimp is cooked. I usually proclaim to have a halo at all times. But sometimes, on rare occasions, I can be a little devilish. Not really bad, but slightly misbehaving. One summer, my son and husband declared "Prank Wars" on me and my daughter. So that little devilish side of me came out. My daughter and I hung every single flip-flop of my husband's from the tree in the front yard. Now, if you know my husband, you know that he only wears flip-flops. Even in the winter. We were in Albuquerque one year at Christmas time, and someone stopped us to take a picture of my husband with shorts and flip-flops on because they couldn't believe he was wearing that. And, yes, there was snow on the ground. Another prank I pulled on my husband is switching out Bud Lite for Pepsi. It was Memorial Day Weekend, and he had a case of Bud Lite. If you know what Bud Lite cans look like, they are very similar to Pepsi cans. I opened the back of the case and randomly traded some of the Bud Lite cans for Pepsi cans. At first, he thought the packaging company made a mistake, but then he figured out that a devilish little woman was responsible. He hates Pepsi, by the way. Now, I'm not sure if it's the devilish side of me or if it's because I'm from Texas, but I love spicy food. 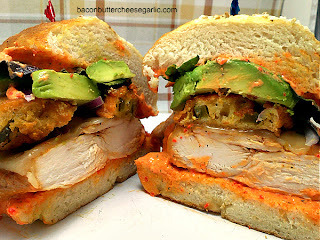 So I created this Chicken Diablo Sandwich to satisfy my spicy craving. Made on a homemade Soft Pretzel Roll and hints of spice from four different pepper sources, this sandwich is a dream. Roasted Red Pepper Spread, Deep-Fried Jalapeno Slices, chipotle-marinated chicken, and pepper jack cheese really make this sandwich awesome. I think you'll love it. Are you a little devilish? In a large zipper bag, mix the marinade ingredients together and cover the chicken with water and marinade the chicken for at least 2 hours and up to 4 hours. After removing them from the marinade, bake them in the oven at 350 for about 14 minutes per side. Melt the pepper jack cheese on the chicken during the last couple of minutes. To assemble the sandwiches, split the rolls in half and spread on some of the Roasted Red Pepper Spread. Top with the fried jalapenos, red onion, avacado and lettuce. Mix the flour, cornmeal, garlic powder, beer, eggs and salt and pepper together with a whisk. Preheat the peanut oil to 350 degrees. Dredge the jalapeno slices in the batter and fry about 2 to 3 minutes or until golden brown. Mix the water, yeast, and sugar together in a mixing bowl and let it sit about 5 minutes until frothy. Add in the flour, butter, and salt. Mix with a dough hook and knead until it turns into a ball. Place the dough in a large greased bowl and cover. Let it rise for at least an hour or until it's doubled in size. Bring a large pot of water to boil. Add in the baking soda. Boil each dough ball for 30 seconds on each side. Place them on the prepared baking sheet. Sprinkle the sea salt and sesame seeds on while they are still wet. Bake them at 425 for about 20 minutes or until well browned on top. Mix the flour, cornmeal, garlic powder, beer, eggs and salt and pepper together with a whisk. Preheat the peanut oil to 350 degrees. 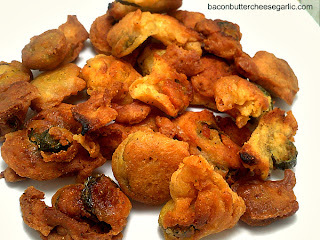 Dredge the jalapeno slices in the batter and fry about 2 to 3 minutes or until golden brown. Great with Ranch dip! Mix all ingredients together in a food processor or blender. 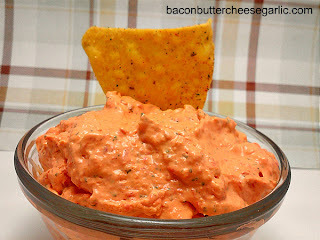 Great as a spread on sandwiches or as a dip for chips, crackers or fresh veggies. Most times, when I cook something, it's usually good the first time. But, every now and then, I create a total flop. I recently made Chicken Marsala, and it was a disaster. 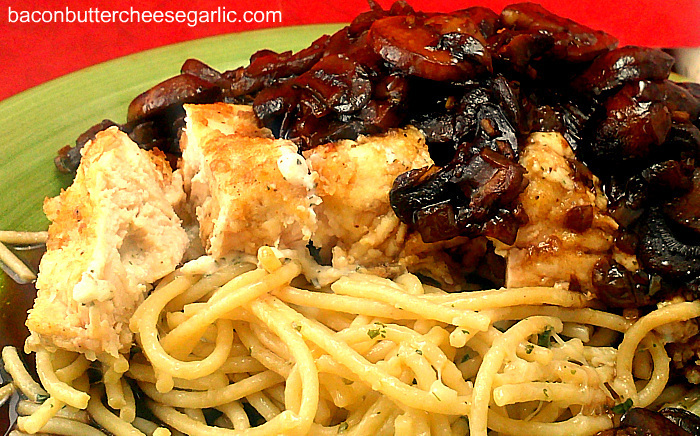 It's supposed to have slightly crispy, lightly flour-dusted pieces of chicken swimming in a beautiful Marsala wine and mushroom sauce. However, what I got was a gummy, pasty mess. I served it over bucatini pasta, which is a dense hollow spaghetti, which made the dish even gummier (is that a word?). The reason it failed is because I added the chicken back into the sauce too soon and the flour rendered the sauce inedible. But there's no way I was going to let that Chicken Marsala beat me. I'm no quitter! So I took a different approach. I headed back into the kitchen to conquer this. I had a team of supporters watching me. My daughter and her friend and my husband sat at the counter as my sideline warriors. It may have been the crazy French bread with butter and olive oil drizzle and melted cheese that kept them there snacking, but I'm giving them the benefit of the doubt. I still lightly coated the chicken with flour, but I didn't put it back into the sauce. And, if you know me, I just had to stuff the chicken. Also, here's a tip when cooking mushrooms. Don't salt them until they are browned. If you salt them early, they will remain gray and will never brown. 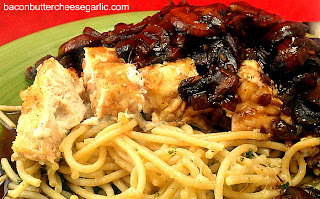 And, to accompany this said Stuffed Chicken Marsala, I made a Garlicky Parmesan Spaghetti to go under it. Or with it. Whichever way you want to look at it. For the chicken filling, blend the cream cheese, Mozzarella cheese, Parmesan cheese, garlic powder, onion powder, and parsley in a food processor. Divide the filling into four and put it into the centers of the chicken breasts. Secure each breast with three toothpicks, making sure no filling shows through. Preheat the oven to 300 degrees. Mix the flour and seasoned salt together. Lightly dredge the chicken pieces in the flour mixture. Preheat a skillet to medium high heat and melt the butter. Drizzle in some olive oil. Brown the chicken in the skillet. Put them on a sheet pan and stick it in the oven to continue cooking while you finish the rest of the meal. In a new skillet, melt the butter and olive oil together. Add in the shallots and mushrooms. Cook them until the mushrooms are browned. Add in salt and pepper to taste. Add in the wine and garlic and cook about 8 minutes until the wine is reduced. When it's reduced by about half, add in the chicken stock. Cook a few more minutes to reduce. Cook the pasta according to directions. After draining the spaghetti, return it to the hot pot. Add in the garlic, Parmesan cheese, parsley, butter and a drizzle of olive oil. Toss with tongs to coat. **NOTE: Please tell the eaters of your food to remove the three toothpicks. Beans and rice are a carb-loaded, ready-for-a-siesta favorite meal in my house. Popular in Mexico, Texas, Louisiana, Haiti, Portugal, and Spain, among others, it's a classic combination of flavors and a very frugal meal. We frequently eat pinto beans and rice and tortillas. And then go take a nap. So this week I decided to look to my neighbors to the right, being Louisiana, who feast on red beans and rice. 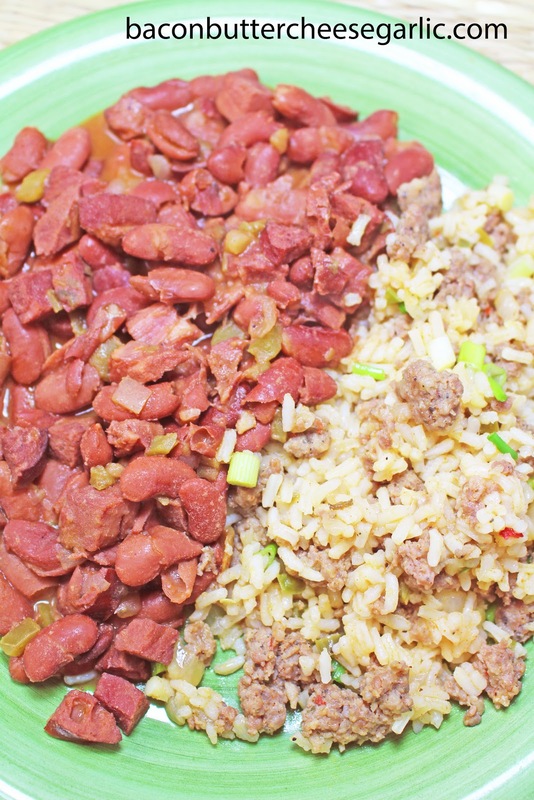 Now, typically, they serve red beans with white rice. However, another popular Cajun dish is dirty rice. No, it's not really filled with dirt. Please don't panic when you read this next part. The reason it's called "dirty" rice is because it's cooked with chicken livers which gives it a darker appearance. I did not cook mine with chicken livers, but, if you're a fan, go for it. I did fill it with a punch of flavor with onions, jalapenos, garlic, and sausage. For the rice, I used ground breakfast sausage. But feel free to use any kind of pork sausage, chicken livers, ham, or even ground beef. I also prepped everything the night before and cooked the beans in the crockpot, so it makes for an easy meal. If you aren't from the South and aren't familiar with these strange flavors, please give it a try. You'll love it so much that you'll be dancing to Zydeco in an instant! For the beans, drizzle some olive oil into a crockpot and add in all of the ingredients. Add in enough chicken stock to cover the beans 1 inch over the top. Cook on low for about 8 hours, checking the liquid level after about 4 hours and adding more, if necessary. Cook until the beans are tender. Taste the beans for salt and pepper and adjust accordingly. For the rice, melt the butter in a large skillet and drizzle in some olive oil. Cook the onion, peppers and celery until they're tender. Add in the sausage and garlic. Cook the sausage, breaking it up as you go, until it's browned. Stir in the rice and the chicken stock. Bring it to a boil. Tightly cover the skillet and reduce the heat to a simmer. Cook until the rice is tender, about 25 minutes. 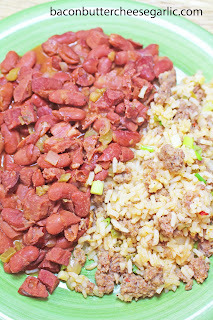 Serve the beans with the rice and hot sauce. Garnish with green onions.